Following Piece, potentially, could use all the time allotted and all the space available: I might be following people, all day long, everyday, through all the streets in New York City. In actuality, following episodes ranged from two or three minutes when someone got into a car and I couldn’t grab a taxi, I couldn’t follow – to seven or eight hours – when a person went to a restaurant, a movie. • A way to get around. (A way to get myself out of the house.) Get into the middle of things. • Out of space. Out of time. (My time and space are taken up, out of myself, into a larger system). All of these ideas were influenced by Acconci’s readings. As many other artists of the period, Acconci wanted to get away from specific art problems and engage with social problems. Acconci read books such as Edward Hall’s The Hidden Dimension (1969), Erving Goffmann’s The Presentation of the Self in Every Day Life (1959), and Kurt Lewin’s In Principles of Topological Psychological (1936/1966). All of these books explored the ways in which the individual and the social are interlinked in terms of complex codes that structure the way we act and live everyday. With regard to the influence on these texts on Following Piece, Acconci’s use of diagrams specifically refers to Lewin’s notion of “field theory”: that is, a model that sought to explain human behaviour in terms of relations and in relation to its environment and surroundings. Lewin placed behaviour in a “field” in order to examine it in a theoretical manner. 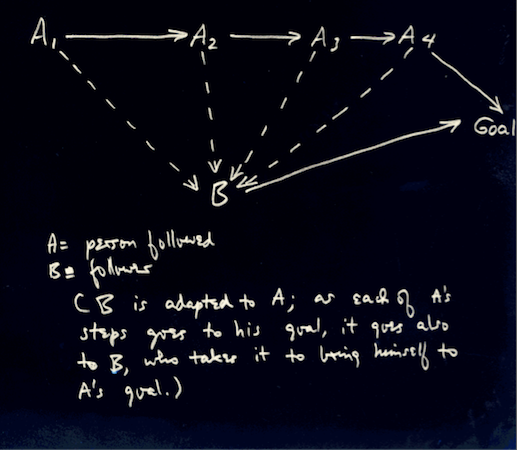 The diagrams drawn by Acconci are an imaginative engagement with this idea of human relations as engaging in a specific field or space. 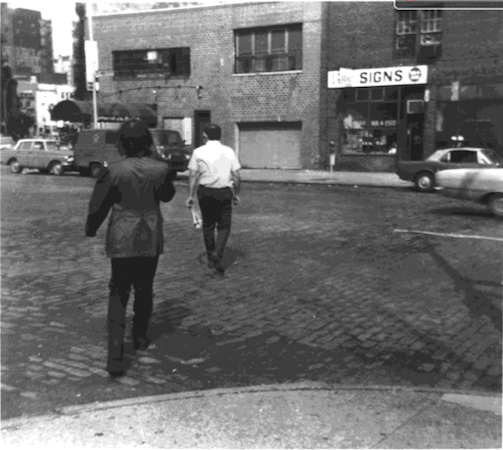 So by following someone around New York, Acconci could perhaps experience what it was like to relinquish self control to others and also explore the intersecting systems that grouped different people together in one field. As we can see from the diagrams, Acconci’s intentions were not subjective but much more systematic—they constituted an exploration of the private and public fields that occur in every social space. Ironically, for all the effort to get out of the gallery, much of Acconci’s documentation of Following Piece, for example, the texts, photographs (which were taken after the event! ), and diagrams, now constitutes a work of art in its own right. MoMA owns several of the photographs of Following Piece and other “versions” of this work are also in existence. So, even though Acconci’s Following Piece was a performance that occurred in a very specific period (3rd to 25th October, 1969), the reproduction and circulation of the work continues. This fact not only teaches us important things about the nature of performance art and its relationship to the art world, but also how the context of the art work is also never exactly fixed and each time it is presented something new occurs with the work itself. Cite this page as: JP McMahon, "Vito Acconci, Following Piece," in Smarthistory, August 9, 2015, accessed April 23, 2019, https://smarthistory.org/vito-acconci-following-piece/.